Fuerteventura is an island of contrasts. There are some of the most beautiful beaches in the Canaries, but the lava fields of the volcanic interior are more like the surface of the moon. 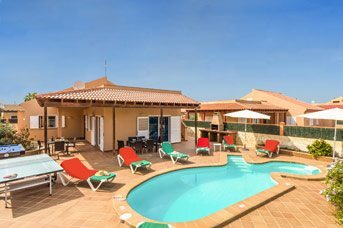 You have the tranquillity and silence of an endless swathe of sand dunes, protected as a nature reserve, and the bars, discos and karaoke of the two main resorts, Caleta de Fuste in the east and Corralejo in the north. You can spend your holiday lazing by the pool at your villa, or soaking up the rays on a fabulous beach. Or you can have a really active holiday, trying out some of the many water sports on offer, and joining the surfing set. You can eat luscious seafood by the harbour in the old town of Corralejo, or you can eat pizza or curry in the new town. You can browse in local markets or check out the big new shopping centres. 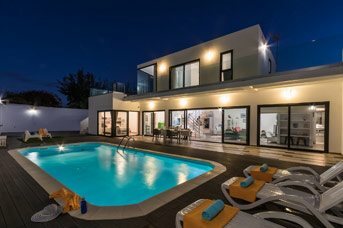 Our villas give you a brilliant base from which to explore, or a home from home you need hardly leave at all! 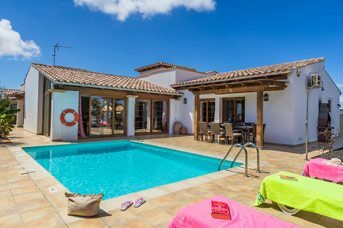 You can choose any one of our villas in Fuerteventura and enjoy a holiday you will dream about for many years to come! 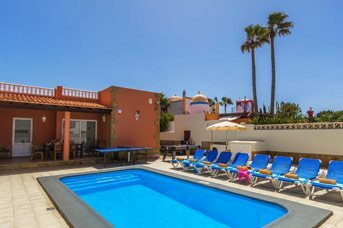 They are all located in or near Corralejo, some close to the main drag and the town beach, others in the gentle outskirts of the resort, or the surrounding countryside. If you want to get out and about, there are boat trips to Lanzarote and Lobos, golf and tennis, scenic walks and water parks, camel rides and karaoke! 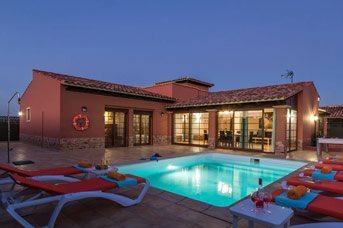 If you just want to relax under a brilliant blue sky, you’ve come to the right place – the beaches are spectacular, and your own pool at the villas is quiet and private. Corralejo delivers sunshine all year round but rarely becomes oppressively hot, although Fuerteventura enjoys an average of three thousand hours of sunshine a year. You are just 100 kilometres from the African coast, and gentle sea breezes give this island a perfect climate all the year round. No wonder so many of our customers return year after year! Famous for the sand dunes! Fuerteventura is an island of contrasts. There are some of the most beautiful beaches in the Canaries, but the lava fields of the volcanic interior are more like the surface of the moon. You have the tranquillity and silence of an endless swathe of sand dunes, protected as a nature reserve, as well as the bars, discos and karaoke of the main resorts. You can spend your holiday lazing by the pool at your villa, or soaking up the rays on a fabulous beach. Or you can have a really active holiday, trying out some of the many water sports on offer, and joining the surfing set. You can eat luscious seafood by the harbour in the old town of Corralejo, or you can eat pizza or curry in the new town. You can browse in local markets or check out the big new shopping centres. 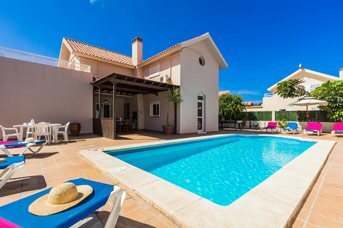 If you just want to relax under a brilliant blue sky, you’ve come to the right place – the beaches are spectacular, and your own pool at the villas is quiet and private. Corralejo delivers sunshine all year round but rarely becomes oppressively hot, although Fuerteventura enjoys an average of three thousand hours of sunshine a year. You are just 65 miles from the African coast, and gentle sea breezes give this island a perfect climate all the year round. No wonder so many of our customers return year after year! Corralejo was once a fishing village with whitewashed cottages clustered around a small harbour and a white sandy beach. 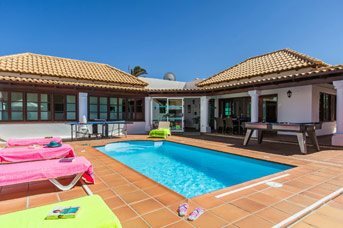 Now a major, modern holiday resort, just 45 minutes from the Island's airport, the town has still retained some of its original laid-back Spanish charm despite its popularity with sun lovers from all around the world. The real heart of the place is the old town - a warren of alleyways and narrow, uneven streets. Some of the original houses have survived, reinvented as shops, bars and seafood restaurants awaiting your discovery. South of Corralejo is a magnificent nature reserve, the Parque Natural de Corralejo, with 7 miles of sand dunes leading down to wide, sandy beaches. The scenery is outstandingly beautiful, and the beaches are ideal for all kinds of water sports, and great for families. If you visit early in the year between January and April, you will find that just about every village, town and city in Fuerteventura hosts its own Carnival during that time. We are talking about a major party! There are lots of events involving music and sport and a big funfair but the highlight is the parade, with exotically adorned floats occupied by scantily clad dancers and a hypnotic drumbeat. After midnight, at the weekend, the party really gets going and lasts till dawn. If you’re looking for a wide beach where you can soak up the sun and enjoy sailing, windsurfing and diving, Caleta de Fuste is a great choice. Because of its location, the beaches are sheltered, making it a popular destination for families. When the sun sets, you have a choice of bars and restaurants from English pubs and Karaoke bars to high-end restaurants. What’s more there’re 2 golf courses, so if you’re a golf fan, this is the place to be! 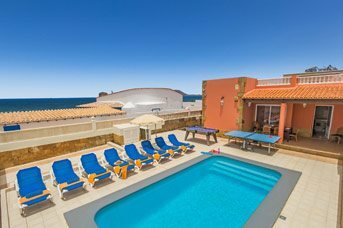 If you want a totally relaxed, sun sea and sand holiday, Corralejo delivers in spades! Once a fishing village with whitewashed cottages clustered around a small harbour and a white sandy beach, Correlejo is now a major holiday resort. the town has still retained some of its original laid-back Spanish charm despite its popularity with sun lovers from all around the world. There is nowhere else in the Canaries with as many large sand dunes and long sandy beaches as here in Fuerteventura. Even though most of the land consists of stone and volcanic rock, these are some of the most impressive beaches in the whole of Europe. 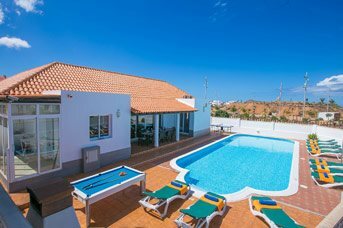 The Island’s main resort is located on the north tip of the island, Corralejo, and offers a great choice of shopping, restaurants, bars and villas. How brave are you? Could you cope with chutes like the Black Hole? Or hurtle at 19mph down a multi-lane racer chute? Baku Waterpark is dare-devil heaven, plus there’s also a wave pool, a lazy river, and a couple of whirlpools. The park offers a gentler experience for tiny tots and those looking to relax. Younger children are also well catered for with and can have fun splashing about in shallow waters, racing down animal-shaped slides and dancingunder mushroom. When you set off from your villa for a day on the beach, you have a great choice! You are just going to have to find your personal favourite. In the town there is the smallest beach within a sheltered bay. Or if size matters, Flag Beach is the biggest, an endless expanse which is heaven for surfers and kite-boarders. In fact, Flag Beach is really three beaches that merge together - called Playa del Pozo, (most popular with naturists), Playa del Medanoand Playa de Viejo. In between there is the busy Galera Beach, which has its fair share of cafes and bars to keep you refreshed and hydrated, and a good range of water sports for the more adventurous. The best way to explore the dramatic coastline of Fuerteventura is by boat. There are all kinds of trips on offer, but if you only do one, don’t miss taking a glass-bottomed boat over to the uninhabited volcanic island of Lobos, which has been an official nature reserve since 1982. There are secluded bays of soft sand and volcanic rocks where you can swim and snorkel, and an interesting walk up to the lighthouse, where you will have brilliant viewsof the island and the ocean. Another interesting day out is a catamaran trip to Playa Blanca in Lanzarote docking at Rubicon Harbour, and returning via the stunning Papagayo beaches with enough time to have a swim. What makes Corralejo unique is the spectacular sweep of sand dunes, looking a lot like the Sahara but apparently made up of shells, spreading over 7 miles along the East Coast, just beyond the town. They are the main reason the Parque Natural de Corralejo was set up in 1982, and are now protected from any building or development. From the beach you have an excellent view of the islands of Lobos and Lanzarote. Water sports are a very big deal in Fuerteventura and every July hundreds of surfers, windsurfers, kitesurfers, and divers descend on the island for the P.W.A world windsurfing speed and slalom event at Sotavento in the south. All year round water babies flock to Corralejo, a famous surfing spot that draws windsurfers from all over the world. It is also an international centre for water skiing, jet skiing, sailing, kite surfing, diving, snorkellingand swimming. Even if you have never tried venturing under the water, there are plenty of places offering equipment and tuition to get you started. The miles of white sandy beaches and turquoise waters make the beaches of Fuerteventura by far the best in the Canary Islands. Fuerteventura can get very windy, though there are a few sheltered beaches along the east coast. The western beaches receive bigger swells and are popular with surfers, though there are some sheltered coves and lagoons there too. In and around the centre of the resort of Corralejo there are several golden and white sandy beaches where the water is crystal clear. The resort is built around the large horseshoe shaped cove. The natural features of this cove mean that there is a gentle slope into the sea and is protected from waves. The beach has been created from imported sand and other bathing areas have been made around lagoons created by digging into the rock behind the shoreline. The beach at Cofete is a white sandy beach. It is not easily reached and this means that there is usually plenty of room. The waves and current can be a bit on the rough side and would recommend taking great care if bathing. In and around the centre of the resort of Corralejo there are several golden and white sandy beaches where the water is crystal clear. Corralejo Town Beach is ideal for families as it is clean, safe, sheltered and surrounded by restaurants Flag Beach is one of the best places to trywater sports such as windsurfing and kitesurfing. Glass Beach and Drop beach are a little further along the road. Around El Cotillo on the north west coast are a series of beaches and coves, that are popular with surfers and is renowned for windsurfing and kitesurfing. Some of the more sheltered lagoons are more suitable for sunbathing. Flag Beach is located just outside of Corralejo and is popular with water sports enthusiasts. The Flag Beach water sports centre is right on the beach where you can book your lessons. The black sand beach has a blue flag and is popular with locals, however the colour of it's sand makes it less popular than the beaches of Corralejo or Jandia. Located between Puerto del Rosario and the Airport is the attractive golden sand beach of Playa Blanca. Grandes Playas Beach is located 5 minute drive from Corralejo where you will find miles of beaches to choose from and enjoy your day. Between Costa Calma and Morro Jable lie the best and longest stretch of beaches on the Island. With bleached white sand and shallow crystal waters, the beaches in both Costa Calma and Morro Jable are very nice and have blue flags, therefore lifeguards, though it's worth exploring the beautiful coves that lie outside the main resorts. Puerto Del Rosario, on the east coast of Fuerteventura, has white sand stretching for about ½ mile. During the summer ther is a flag system to show when it is safe to swim and there are lifeguards on the beach during busy periods. This beach is often used by the locals and is also popular with surfers. In the main town of Corralejo you have the Waikiki Beach, which is a secluded bay and ideal for families with young children. There is also a restaurant located on this beach. 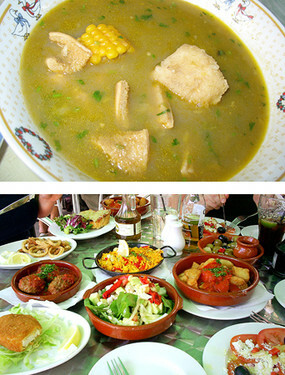 Much like the island's native language, the cuisine in Fuerteventura is thoroughly Spanish. As such, expect lots of tapas-style dishes when dining out on the island, as well as plenty of seafood – there is a readily available source of it close by, after all. As well as a healthy helping of fish, the islanders are also partial to goat, be it their meat or milk for cheese. Braised beef, pork and rabbit are also very popular, and are often served with wrinkled potatoes and mojo, a hot, peppery sauce that's a firm favourite with locals. You will find that many of the restaurants on the island have a worldwide influence though, with Italian, Chinese and English cuisine all well-represented in the main resorts along with more local offerings. If you fancy trying something a little different, be sure to check out Fuerteventura's many markets. There is a big emphasis in Fuerteventura on art-based markets, with many African artworks on display alongside the food. If you'd really like to rub shoulders with the locals and sample some incredibly fresh produce, then be sure to visit the market in Puerto Del Rosario, situated above the bus station. It only runs on Saturdays though, and shuts up shop just after lunch so be sure to head down there early to catch the goods! You'll find a few foodie delights at other markets too, but they will be featured alongside other African arts-based goods.Rather than fresh produce, at the Baku Water Park in Corralejo, you’re likely to be able to buy bottled mojo or alioi sauce. You'll also find markets in Costa Calma, and in Morro Jable at the Cosmo Shopping Centre. There are a few dishes that Fuerteventura can call their own, but as the climate is typically very dry and warm, it can be difficult to grow a mass array of food items on the island. It's because of this that the Fuerteventura palate is a simple one, but that doesn't mean that the locals are happy to compromise on taste. Fish- Whilst fish is always on the menu here, you'll find that the locals enjoy sitting down to a hearty dinner of goat. Traditionally, Fuerteventuran fish is served salted (called pejines) or in a stew, called sancocho, and is usually made from the grouper fish along with sama fish and corvina fish. This stew can be served with a Canarian favourite of papas arrugadas which are salted, wrinkled potatoes with spicy mojo sauce, or with gofio, a type of grain that can be added to thicken the stew, and to add vitamins, fibre and protein. 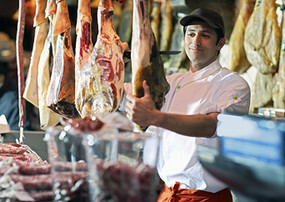 Meat- In terms of meat, grilled or braised beef is popular, as is pork, which can often be taken from piglets too. Similarly, islanders enjoy goat meat, both from the adult goats and the kids, and make good use of their milk too.The majorero and palmero cheeses are delicious, and have protected designation of origin status. As well as all of the above, Fuerteventura is a good place to visit for authentic tapas, and you can find out more about typical tapas dishes here on the Villa Plus guide to Fuerteventura. If being on holiday means that you have to experience different tastes as well as cultures, then it's always a good idea to have a little try of the offerings before you depart. 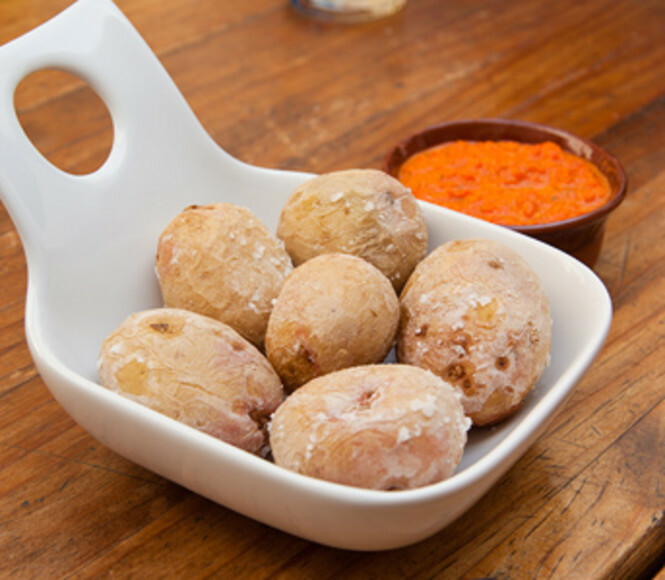 Whilst Spanish food is readily available in Fuerteventura, traditional island food can be quite unique. From roasted piglet to the salted potatoes, Fuerteventura has its own flavour and it's not hard to recreate this at home. We're going to take a look at how to make Lentejas, which is a popular lentil and pork soup and those infamous salted potatoes, otherwise known as papas arrugadas – though the usually accompanying mojo might not suit the soup in a meal! Firstly, you need to rinse the lentils and soak them for one hour in a pan. Whilst the lentils are soaking, peel and chop the potatoes into one inch cubes, and the same with the carrots – though these are best chopped into half inch cubes! Cut up the celery stalks and slice the garlic cloves also. Then, chop up the pork into reasonably sized chunks before sautéing the veg and pork in oil for around 5 minutes. Next, add enough water to the pot so that the veg and pork are covered, and bring that to the boil. Then, be sure to add your soaked lentils to the pot and regularly check it, being sure to add more water when necessary. It will take an hour to cook, but once you're happy add the cumin, salt and pepper to taste and serve up with the potatoes, the easy recipe of which is below. Sea salt if possible, though regular salt is fine too. Firstly, add the potatoes to a pot of water, and add enough salt to make them float. This may take a good few spoonfuls! Boil the water and allow the potatoes to simmer for 20 minutes. After this time, pour away the majority of the water and cover the potatoes with a layer of salt. Turn the heat down, and gently jostle the pot so that the salt covers all the potatoes and almost crystallises on the skins. After this, cover with a tea towel, remove from the heat and leave for 5 minutes to allow the potatoes to form their traditional wrinkle. 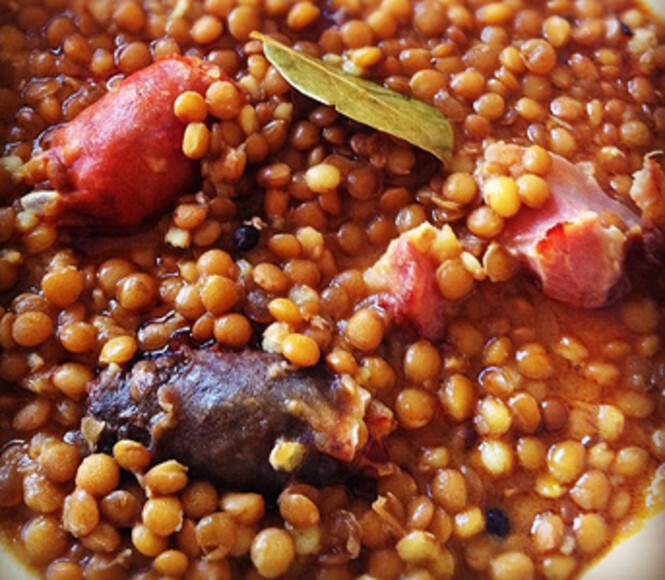 Served with the hot lentil soup, it's a hearty meal that's perfect for enjoying both at home and on the island.